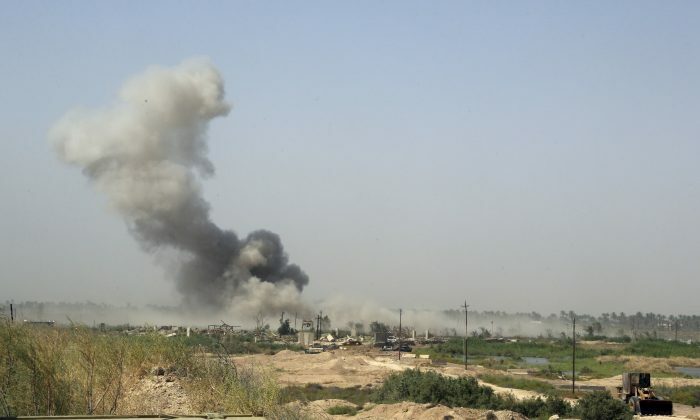 A U.S. warplane hit forces belonging to an allied Sunni Muslim militant group that Washington had trained to fight against ISIS in an apparent case of friendly fire, the Wall Street Journal is reporting. The Pentagon, as a result, has launched an internal investigation into the matter, the paper said. “The coalition was subsequently informed that one of the airstrikes may have hit counter-ISIL forces and their vehicle, instead of ISIL forces. Initial reports were that four counter-ISIL personnel may have been killed in the strike,” Centcom spokesman Colonel Patrick Ryder said. On May 27 and May 28, American forces carried out airstrikes around the city of Ma’ra, Syria. The strikes hit Islamic State, known as ISIS or ISIL, forces, but the Pentagon-backed Mutasim Brigade said an airstrike hit its troops, leaving 10 fighters dead, according to the WSJ report. Centcom confirmed that a friendly fire incident indeed took place, but said there were a smaller number of casualties than what Mutasim reported. “Initial reports were that four counter-ISIL personnel may have been killed in the strike,” Ryder said. “An investigation into this incident has been initiated. We will continue our support to counter-ISIL forces and will apply any lessons learned derived from the investigation to improve our operations in the future,” Ryder noted. The errant airstrike appears to be the first friendly-fire event acknowledged by U.S. Central Command involving U.S. forces in Syria. Another incident took place in Iraq in December 2015, and it was publicly disclosed by Centcom at the time.